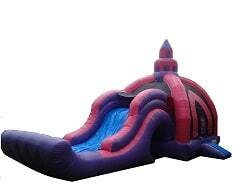 This slide jumper has all the same dimensions and exciting features as the Fundome Slide, only in purple and pink. Regardless of color, girls and boys BOTH love these ultimate party bouncers! Capacity: 1-8 participants, up to 150lbs. Max 1000lbs. Minimum space: 35'L x 18'W x 16'H.